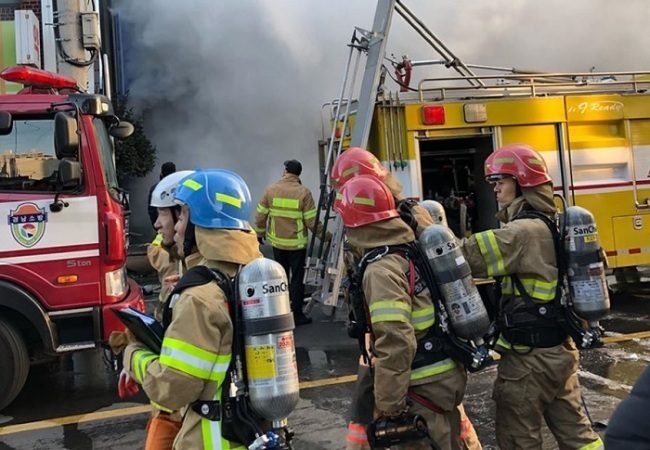 At least 37 people were killed and more than 100 injured when a blaze broke out at a hospital in Miryang, South Gyeongsang Province, Friday, according to fire officials as of 5 p.m., just a month after 29 died in a fire in a fitness center fire elsewhere. The death toll could rise, as 18 among the injured who were taken to nearby hospitals were in critical condition, the officials said. 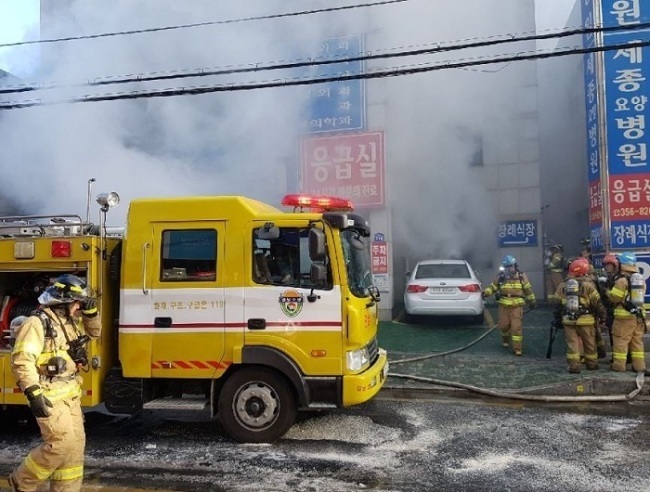 The fire is thought to have started at around 7:30 a.m. in the emergency room on the first floor of Miryang’s Sejong Hospital, and was put out at 10:26 a.m., according to firefighters. A reported 194 patients were at the hospital at the time of the fire. Of them, 94 were in a nursing home for the elderly next to the main building, and were all safely evacuated. 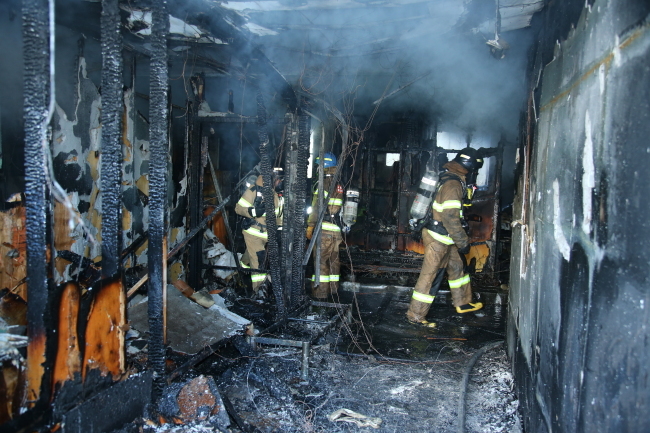 The victims appear to have died from smoke inhalation. Many of the deaths were confirmed while the victims were being taken to six nearby hospitals. Sejong Hospital has 193 beds -- 98 in the nursing home -- and offers nursing care as well as regular medical services. The total number of hospital staff present is not yet confirmed, but about 35 medical staff members worked there. At the time of the fire, two doctors and nine nurses and nursing assistants were present, according to local news outlets. Of those 11, one doctor, one nurse and one nurse’s assistant are among the death toll. Following the deadly incident, President Moon Jae-in convened an emergency meeting of top presidential aides at Cheong Wa Dae to discuss ways to minimize casualties. Moon expressed regret over the blaze and called to “mobilize all possible resources of the government” to save the lives of those rescued to prevent additional deaths, presidential office spokesman Park Soo-hyun told a press briefing. Fire officials said the death toll could increase, as some of the patients taken to the six nearby hospitals are in a severe condition. Minister of Interior and Safety Kim Boo-kyum headed to the southern city at around 9 a.m. to oversee the response measures. Prime Minister Lee Nak-yeon, who earlier ordered concerned government agencies to roll out concerted measures to handle the situation, followed in the afternoon. South Gyeongsang Provincial Police Agency and the National Institute of Scientific Investigation launched an investigation into the cause of the fire. Police have reportedly obtained testimonies from the hospital’s medical staff that they first spotted the fire in a dressing room for nurses next to the emergency room. The fire is one of several deadly blazes in recent years. In late December, 29 people died in a fire that was fueled by flammable cladding on the outside of a fitness center in Jecheon, North Chungcheong Province. In 2015, a fire that broke out at an apartment in Uijeongbu, just north of Seoul, killed five and injured 125.